Since I only posted once in December, I'm going to try and play catch up with Christmas before January is over ! A little decor and a couple of crafts. The tree that never changes, even though I'd like it to sometimes ! I love those beautifully decorated, classically beautiful trees, but I keep coming back to tradition. The Starbucks tree, that has hardly any room for anything ! When I first did this tree, 15 or so years ago, I just had the "popcorn" balls, and little Starbucks sample cups the I hung all over. Then came the popcorn garland and wooden candy canes. Then, some little kitchen ornaments and tiny mittens. And when those little vintage trailers started coming out? Oh my ! Now instead of the cups, I have real Starbucks ornaments and cute gift cards from all over. This year I added the big, ball lights. My office tree. Forgot to take one with the lights on ! I got the picture this year, at Grandiflora , and I got the scooter at a Junk show. I got that little red chair at the same show, and the bucket at the Farmchicks show. I painted the table this year too. Tiny view of the hutch. I was not on my "picture game" this year ! The entry, with my first real chalkboard that I "copied" all by myself ! I did a few crafts this year too ! I've had these Starbucks cards for a few years now. They give all their decor away after Christmas, or sell it for pennies, and I put my name on these right away ! I wanted a little decor for my guest room so I took some frames and painted them, and then I strung the cards and taped the string to the frames. So simple ! I put them on the board and batten ledge around the room. I also glittered some vintage cookie cutters ... that was really fun ! I do enjoy an evening of glittering! This was a fun craft too ! Trying to find the old cars took awhile, but was worth it ! Just some cars in a jar with a little snow in it ! I decided to glitter the lid of this one, and I added some string and bells too. I know I have some photos on my phone, but I don't have the energy to dig through them ! Besides, this is pretty boring now that Christmas is over ! A few more Christmas posts (I hope) and then I can get on to something else ! Twas a BIG day here in Washington State !!!! 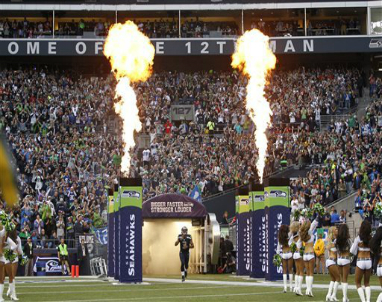 Seattle Seahawks are heading to New York to play in the Super Bowl, which you may or may not have heard !!! 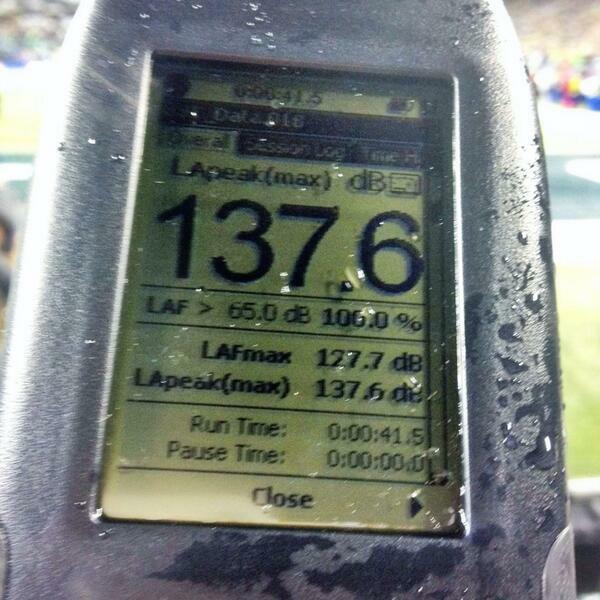 I've been to a few games in this stadium and when people say it's loud they mean it !! I have to plug my ears when I'm there...it's like a vacuum sucking out your brain !!!!! 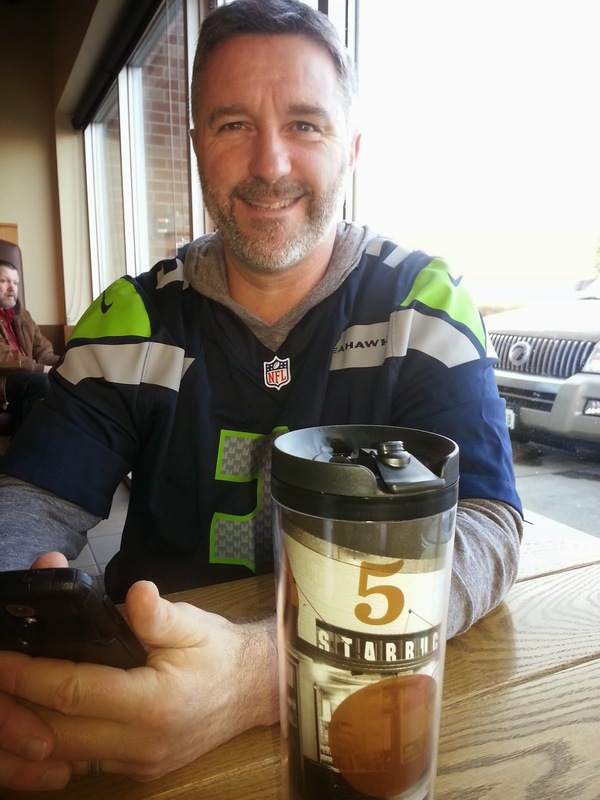 Every Friday is known as "Blue Friday", and many companies let their employees wear Seahawk garb to work. Last Friday, Starbucks offered coffee for 12cents if you were wearing blue and green. Hubby and I took advantage of that one ! 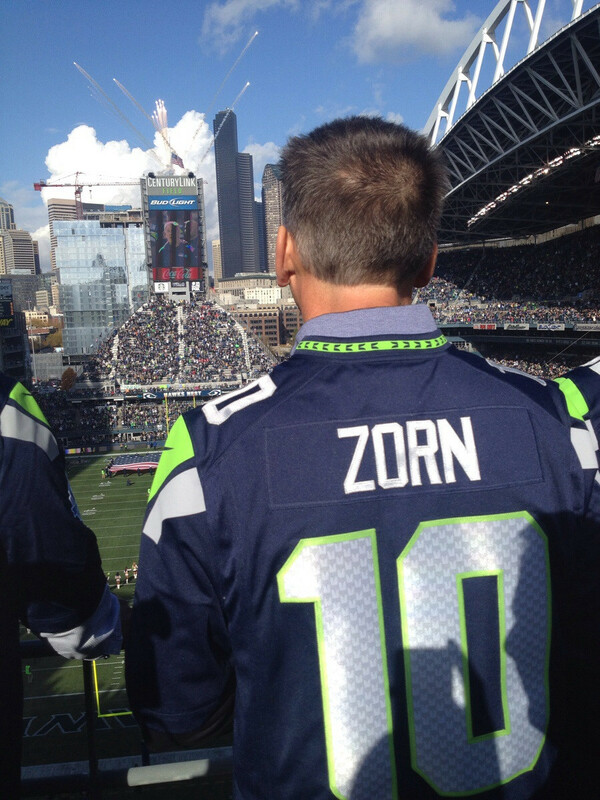 12 is my favorite number, so I have the 12th man jersey and I wear it faithfully every Friday and Sunday. You may think that would be awkward in church, but I am not in the minority there !! 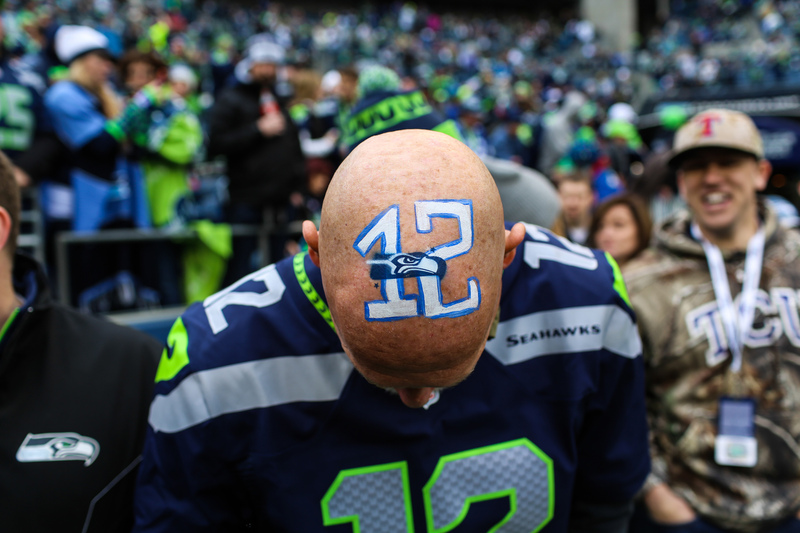 The 12th Man is a big deal here...best fans anywhere...ever !!! Raising the 12th Man flag before every game is a big deal. And Jay Buhner showed us that bald can be beautiful !! The 12th Man is pretty awesome !! Congratulations Seattle Seahawks !!!! Let's win the Super Bowl !!!! P.S. Is it too late to blog about Christmas ? I'm a little behind. Our Christmas Bunco is always so much fun and this year was no exception! We always combine November and December and have two hosts instead of one. Things get so hectic around the holidays that this seems to work out best for everyone. Plus, the anticipation builds for two months instead of one! This year was hosted by Kristi and Lydia and they did an amazing job! Wonderful appetizers, an incredible dinner and a beautiful and delicious dessert. I must say that we always eat quite well at Bunco!! Lydia served these delicious candy cane drinks ~ so festive ! Kristi made a wonderful dinner ~ a wonderful salad, corn cups, rice and chicken cordon bleu ~ everything tasted so good ! These desserts were so pretty and festive. A meringue base with whipped cream and fresh berries. The girls did a "Favorite Things" theme with each of us bringing four of our favorite things with a limit of $5 each. Then we drew names and numbers and spread the gifts throughout the evening. I wish I had gotten pictures of all the gifts, but I was too busy enjoying the moment ! Wonderful gifts, wonderful food, wonderful ladies, all who share the love of Jesus. Friends, prayer warriors, mamas, amazing women ! I love you all ~ Merry Christmas Girls !